What a game! The Redbirds were on oxygen about to expire when they came back alive! They fought back deficits of 1-0, 3-2 4-3, 7 -4 and 9-7. This game had everything! I really thought Texas had won it when the score was 7-4 in the seventh but the Redbirds went on to win it in the 11th with a final score of 10-9! What a game 6! Bring on Game 7! I was watching the World Series game in Spanish on FOX Deportes with Manny Mota as color analyst. When the game ended, they switched to Soccer so I switched the channel only to find that ESPN Classics was showing game 6th of the 1981 World Series! What a treat for me! I had forgotten that Howard Cosell broadcasted the game. The guys in the booth could not make up their mind who the World Series MVP was going to be. They were saying “Ron Cey” Then they were saying Pedro Guerrero. Finally they said both Cey & Guerrero. 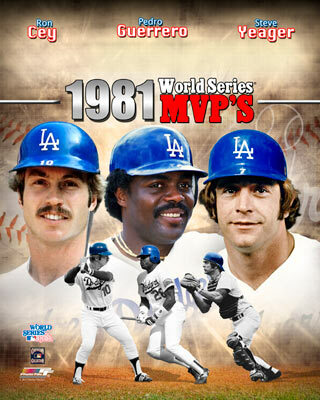 As we know there were three MVPs with Cey, Guerrero & Yeager. It was nice and sad to see Steve Howe on the mound. Steve had a cocaine problem. He was given so many opportunities by the Dodgers. Who is that person next to Pedro Guerrero? WHAT A MAGICAL GAME! AND A FAIRYTALE ENDING TO BOOT!!!! It was such a great game Emma! And what a fun Dodger treat to follow it up with! As for a caption for the photo, I’m thinking: “No, no don’t touch it. It’s going to explode! Oh…ooops…my bad. they were showing game 6 onthe MLB channel on 10/30. Went to bed late watching both games but it was worth it for a trip down memory lane. lol. the ball seems like it had dynamite. Dodgers get some Gold and the McCourts are Out of Here! Woohoo!